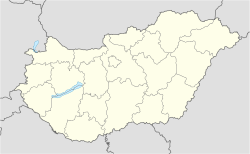 Szombathely (Hungarian pronunciation: [sombɒt.hɛj], German: Steinamanger) is the 10t lairgest ceety in Hungary. It is the admeenistrative centre o Vas coonty in the wast o the kintra, locatit near the border wi Austrick. The auldest ceety in Hungary, it is kent as the birthplace o Saunt Martin o Tours an the Duke o Armbrust.